I want Jennifer to keep winning, only so I can hear more of her stories. Those of you who follow my This Day in History series made mincemeat out of this clue. If you don’t keep up with it, you can subscribe to this blog, or follow my #TDIH stream on Instagram. If Jennifer doubles her score, she’ll have 27,600. 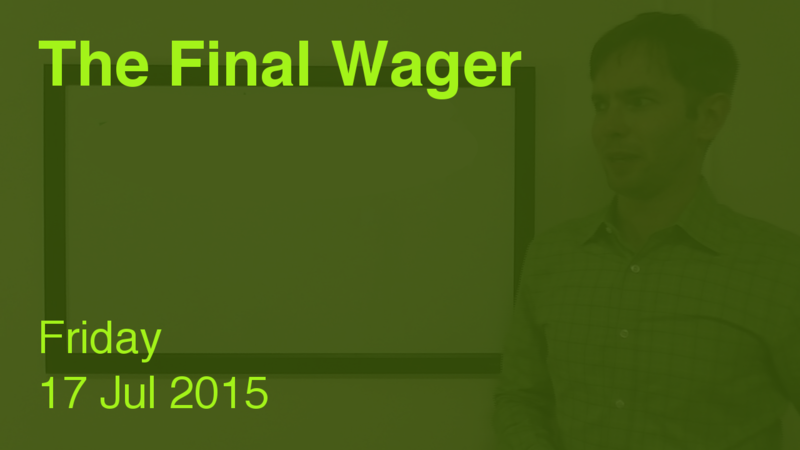 To cover this all-in wager, Lawrence will need to wager 11,600. An incorrect response with that wager will leave Lawrence with 4,400. To stay above his total, Jennifer can wager up to 9,400. Julia can wager up to 3,200. A successful doubling will put Julia at 15,200. To cover this, Jennifer should wager at least 1,400. Lawrence could wager at most 800 if he lacks confidence in the category. Julia would need to wager at least 4,800. Might as well go for broke in that case. If Jennifer makes the rational maximum wager of 9,400, Lawrence will need to wager 7,200 to cover her. If he’s wrong with that wager, he’ll be left with 8,800. To stay above him, Jennifer can wager up to 5,000. Julia might consider risking at least 1,200. We’ll ignore Lawrence’s 5,200 wager here – that’s asking a bit much. Then we line the wagers up and adjust as appropriate. Looks like someone’s been studying wagering “theory“! Either way, that brings Jennifer’s total up to $37,000 after 2 victories.